ACD FotoCanvas, your easy and affordable photo editing software, includes all the essential editing and correction tools and no confusing controls you don't need. Plus, get creative with talk bubbles and 40 stylish filters. Get accurate color with professional color management. A powerful image editor at an affordable price: "Unusually well-conceived," says American Photo magazine. Enhance and Correct Your PhotosUse the simple Photo Correction Wizard to fix common problems, such as light levels, red-eye and rotation. Take advantage of advanced editing features such as the ability to select a picture area and alter it without altering the rest, as well as blending tools and manual controls for image detail. Get great photos...even from average snaps. Make Superb Graphics with Special Effects and Creative ToolsAdd text and use professional selection and drawing tools for image editing. Add talk and thought bubbles for humorous photos. Apply 40+ special effects to turn photos into graphics. Add Photoshop plug-ins such as Alien Skin filters to the FotoCanvas image editor. Easy, Powerful & AffordableDesigned especially for digital photos, FotoCanvas helps you as you work, making picture edits easy, fast and fun. You also get the precision you need to make simple web graphics or perform advanced edits on a whole picture or just a selected area. Get professional color management using ICM 2.0 and ICC color profiles. Work with several photos at once using a handy image browser to switch between them and use a survey window to keep track of where you are in a large photo. Plus, hide and dock tool panels to save space and enjoy additional convenience. 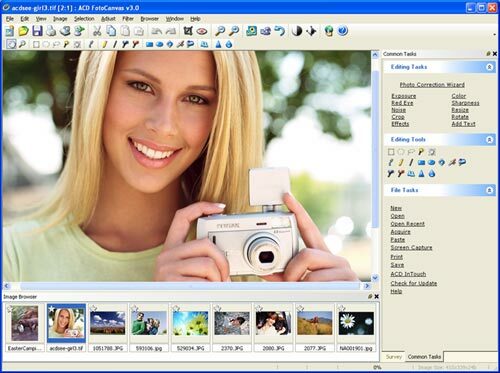 The easiest, most complete photo editing software at an affordable price.